This anti-static bar has the same properties as the P-Sh-N. but is equipped with an integrated power unit, you do not need a high-voltage cable. 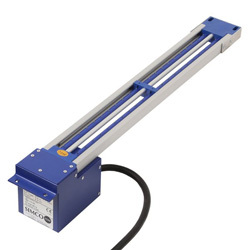 This anti-static bar has been approved for use in certain hazardous environments. The 5m long primary cable shall be connected to the mains voltage. A neon lamp can indicate that high voltage is present. Under certain conditions the P-Sh-N-Ex bar is capable of neutralizing the materials from a maximum distance of 200 mm. Working distance 200 mm max.